Calcium (Ca2+) is the most abundant divalent ion in the body. Approximately 1.2–1.3 kg of Ca2+ is present in a 70-kg individual. Of this amount, 99 % is present in the bone in the form of hydroxyapatite (Ca10(PO4)6 (OH)2), and the remaining 1 % is found in the teeth, soft tissues, plasma, and cells. The plasma (serum) Ca2+ concentration (abbreviated as [Ca2+]) is 10 mg/dL (range 8.5–10.5 mg/dL) and circulates in three forms. About 50 % of Ca2+ exists as a free or ionized form. Approximately 40 % of Ca2+ is bound to proteins, mostly to albumin and to some extent globulins. The remaining 10 % is complexed with anions such as phosphate, bicarbonate, and citrate (Table 17.1). Only the ionized and anion-complexed Ca2+ is filtered at the glomerulus. Protein-bound Ca2+ is not filtered. Only the ionized (free) Ca2+ is physiologically active. The free intracellular [Ca2+] is about 10,000-fold lower than the extracellular free [Ca2+]; this concentration gradient is maintained by Ca2+-specific channels, Ca-ATPase, and a Na/Ca exchanger.Ca2+ plays a significant role in cellular metabolic functions; such as muscle and nerve contraction, activation of enzyme, blood coagulation, and cell growth. 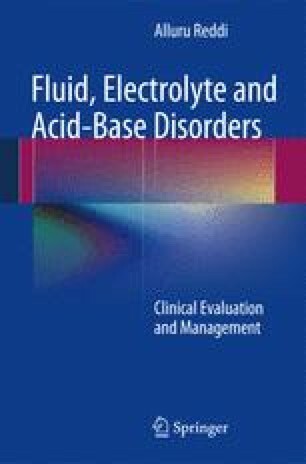 Consequently, low plasma [Ca2+] (hypocalcemia) or high plasma [Ca2+] (hypercalcemia) may lead to severe cellular dysfunction.